People love snow for a number of reasons. Not only does it make for picturesque winter landscapes, but it also lets people enjoy winter activities like skiing and sledding. Yet all the joy and fun that accompany snowfall is balanced by the need for snow shoveling. This slightly laborious endeavor can ruin even the most crisp and gorgeous winter day. 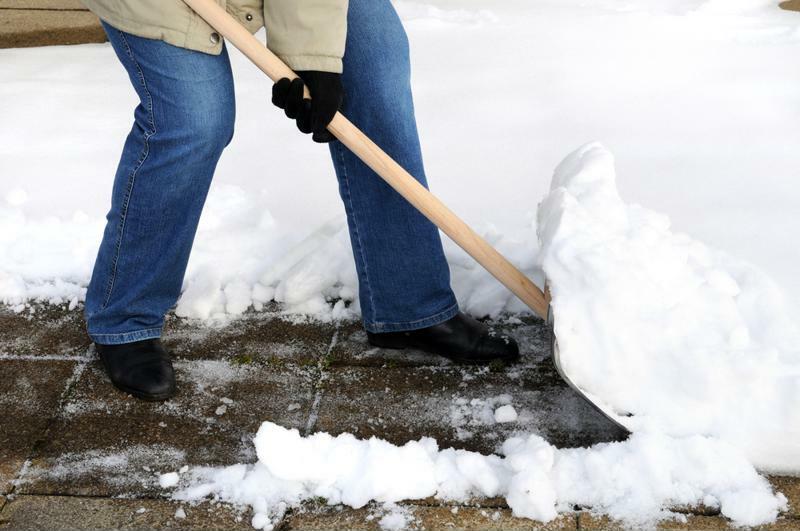 It’s more than just an exercise in aggravation, though: According to a report published in the American Journal of Emergency Medicine, an average of 11,500 emergency room visits stem from shoveling-related injuries each year. 1. Always stretch: In many ways, shoveling or blowing snow is just another form of winter exercise, like jogging or snowshoe walking. As such, it’s important to do a few stretches before you start shoveling. Focus on your lower body, like your hamstrings and calves, and also your lower back, as these are all part of the shoveling or blowing process. 2. Push, don’t lift: More experienced homeowners will physically move the snow, lifting it with a shovel into a container that is then dumped elsewhere. However, trying to lift the snow is not only dangerous, but it can also become a huge time waster. Snow shoveling or blowing is all about moving the snow in one pile that’s cleared of any major thoroughfares. If you must lift snow, always use a smaller shovel to prevent overexertion. 3. Dress accordingly: Depending on the amount of snowfall and the size of your driveway, you might be outside for up to an hour shoveling. As such, dress as you would during any other snow day. That means wearing plenty of layers – with a proper mixture of both ventilation and insulation – including heavy duty socks and a hat or beanie. Also, consider wearing shoes with slip-resistant soles or a good, solid grip, such as work boots. Shoveling snow requires great attention and safety. 4. Give yourself plenty of time: Because of the inherent dangers associated with snow shoveling and blowing, you always want to take your time. That means giving yourself enough hours in the day so you aren’t rushing. Part of that is also working while daylight is still available, which can go a long way in preventing many slips or accidents. If you must shovel away at night, always be sure that there is a reliable light source, like garage or street lights. 5. Choose the right equipment: If you do things the old-fashioned way – like not using a snow blower – then you need to put some effort into choosing the right shovel. Always go for something with a curved handle, which will let you shovel and keep your back straight simultaneously. Also, consider whether you use a smaller or larger blade; the former can limit how much snow you move, which can prevent you from overdoing it. Finally, do you want to use a plastic or metal shovel? Generally, lighter materials will be much better on your spine. No one wants to head outside to shovel the driveway only to end up on his or her backside. However, if you do experience a fall or accident while snow shoveling, you can always rely on CareWell Urgent care. With doctors on staff at locations across the Eastern seaboard, CareWell can treat anything from sorted bumps and bruises to sprained ankles and much more.